After testing so many Online TV softwares to watch TV online, here's the best software to watch TV online with many features like live recording, audio CD ripping, all in one pack. Best thing, its free and offers 4000 TV channels , It also includes adult (18+) TV channels which you can block or filter by using file> settings> filter adult content. You just need a high speed internet connection to enjoy this software otherwise streaming will be slow. It is absolutely free and offers maximum Indian TV channels, It includes all Indian Hindi TV channels like Zee Tv, Star Plus, Sony, Set Max, Colors, SAB etc. You can now even record TV programs , all streams ranges from 44 to 115 kbps, So, your internet connection should be fast. 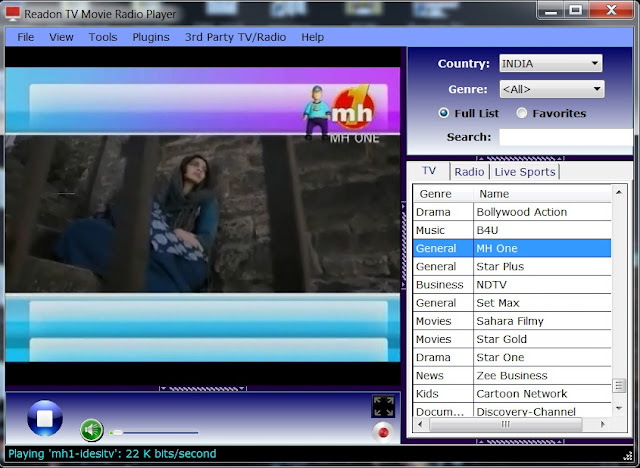 It also offers radio channels to listen from worldwide, Audio CD ripper etc. It is just 6.5 MB in size. You need Dot Net Framework 3.5 or above version to run this program . you can download it from the link below. You can download it from here & to download DotNET Framework ,download it from here.